The Guest from Italy directed by Federico Olivetti has been chosen by Filmmakers World Festival (FWF) as the Overall Winner for 2016. This film was competing for the prestigious title with film such as Before Spring (Egypt) directed by Ahmed Atef, God is American (France) directed by Richard Martin-Jordan, Krusing America (United States) directed by Linda Kruse, Backstage (Syrian Arab Republic) directed by Fouad Hallak, Baobabs between Land and Sea (France) directed by Cyrille Cornu, BEN (India) directed by Vipin Atley, Eastern Indochina - Documenting a Journey (Poland) directed by Pawel Zgrzebnicki, Firebird (Australia) directed by lan Nguyen, The Trouble with Aoibhe (Ireland) directed by Ross Carey and Jerusalem In Line directed by Amir Har-Gil. Dr. Sajan George, producer of Ben in his winning speech, said that he is very honored for the special Platinum Awards from FWF. His movie Ben has received many appreciation. It tells the story of the crime the parents did to their children in the name of good grades in school without thinking about the children happiness. Director Alan Nguyen from Australia with his film Firebird, was also very happy to receive the Platinum Awards directly from the Indonesia Minister of Social Affairs Dra. 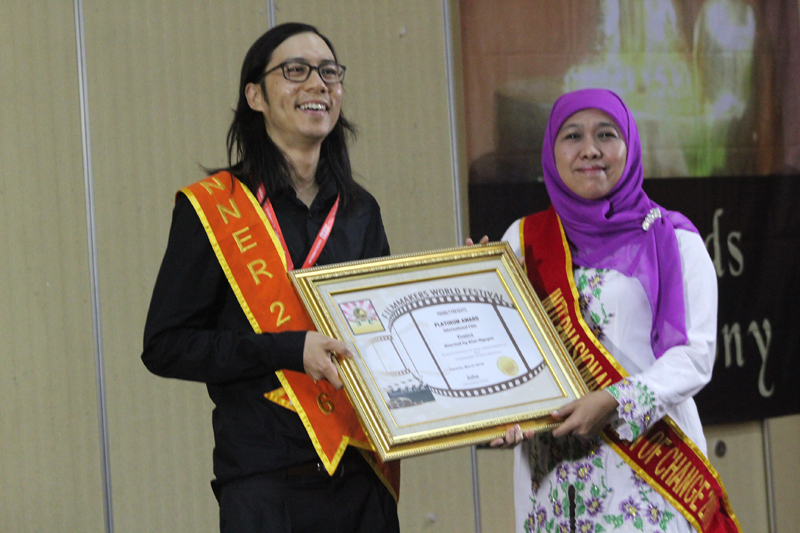 Khofifah Indar Parawansa in a special Awards Ceremony which was held in the historical Auditorium of RRI. During the ceremony, Diamond Awards was also presented to Before Spring (Egypt) directed by Ahmed Atef. Mr. Atef is a senior filmmaker, film critique, and was the jury of Cannes Film Festival in 2011. Mr. Atef, in his winning speech thanked the jury for the award. Awards for winners were presented by Dra. Khofifah Indar Parawansa, the Indonesian Minister of Social Affairs, Dr. Ir. Siti Nurbaya Bakar, M.Sc., the Indonesian Minister for Environment and Forestry, President Director of RRI Dra. Rosarita Niken Widiastuti MSi., Senior Adviser of People Creative Council Lily Wahid and many Indonesian celebrities and government officials. The glorious Awards Night was held at the Auditorium Radio Republic Indonesia Jakarta and attended by many winning filmmakers from various country including Dr. Sajan George Kavinkalath, Dr. Shahida Akhter, Derrick Lui, Alfie Law, Alan Nguyen, Ahmed Atef, Sumathy Balaram, and many more. Winning films has been screened from March 7 in Russian Cultural Center Jakarta, Terrace Cibulan, Itinerant Cinema, several high schools, and other places. 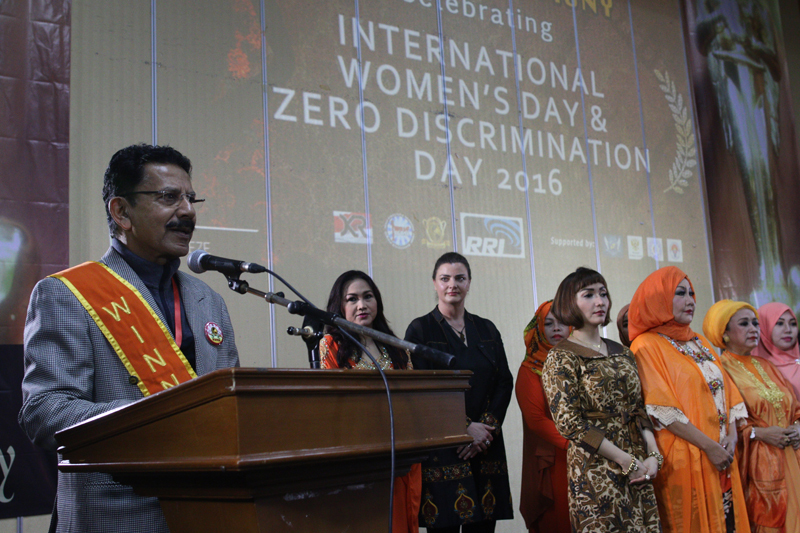 These films screening will be ended on March 30, which was the Indonesian Film Day. The event is fully supported by the Ministry of Youth, i-Hebat International Volunteers, Terrace Cibulan Cafe, Care for Indonesian Children Foundation (Yayasan Peduli Anak Indonesia), Russian Culture Centre, World Film Council, and Radio Republic Indonesia (RRI) which is the official media partner.